We are located in one of the most beautiful regions of the country, the Blue Ridge Mountains. Many property owners who live in the High Country want to maximize their views and make the most of their location. We can help you with any view planning that you might need for your mountain setting. In addition to Banner Elk, we service all of the neighboring areas, including Linville, Boone, Blowing Rock, Newland, Valle Crucis, and all the communities inbetween. We place a great deal of emphasis on safety and high customer satisfaction before, during, and after the job is complete. Let our professionals work with you to make the appropriate decisions for view enhancement for your mountain setting. We understand that your tree service needs are important to you and perhaps unique. We take this into account when we meet with you to give you an estimate on view enhancement. Sometimes we utilize our bucket truck when we prune trees to improve your view. 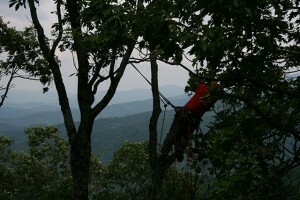 Our arborists are well trained in its use as well as any equipment needed for a job. In addition to view enhancement we offer other tree services, including pruning, tree removal, stump grinding, bucket truck service, crane service, lightning protection, tree cabling, pre-construction consultation, and fertilization and pest control. Our team is led by Tony Hunter who has years of experience working in the tree care industry. Both he and his wife, Judy, are certified arborists who stay abreast of new standards and innovations regarding tree care.